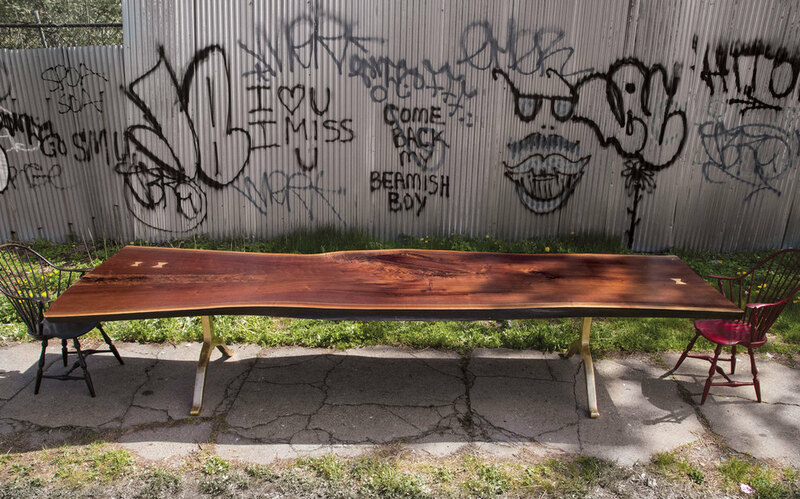 SENTIENT’s live edge tables and other designs are made using sustainably sourced American black walnut, spalted maple, cherry, oak and other hardwoods. We always keep a supply of slabs and boards. Some will be air drying for up to 18 months or ready to go into the kiln for up to 3 months for the final drying. At this point a suitable slab is brought to the workshop where it is transformed to a beautiful piece of furniture or art. There are many great things about New York but little known is the fact that it is located within easy reach of many of the great furniture grade hardwoods. 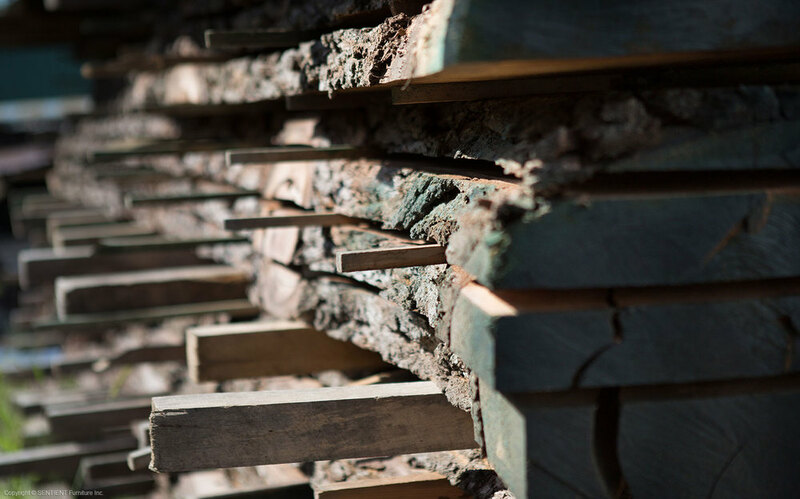 The forests where these hardwoods are found reach from New England and all the way through the Mid West of the United States. 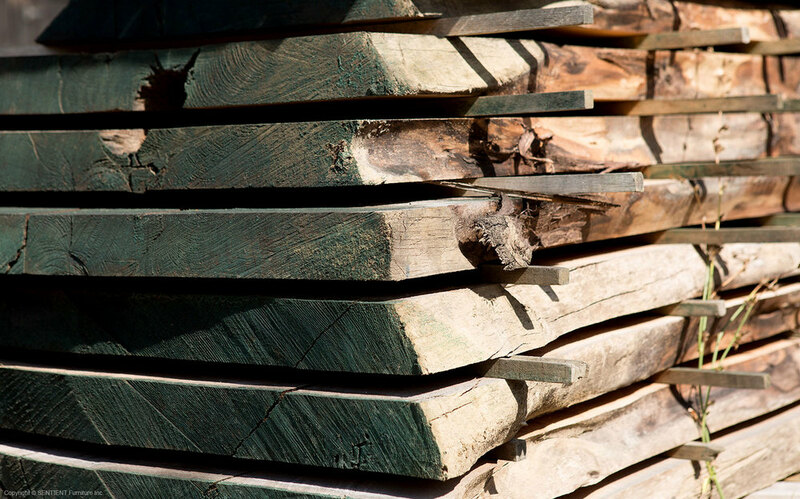 We have plentiful supply of sustainably sourced walnut, oak, white oak, maple, cherry and other hardwoods. 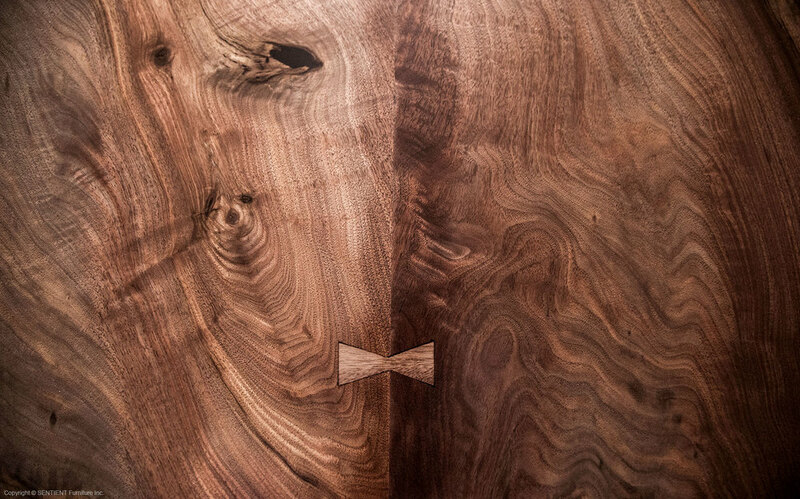 Of these woods arguably the most striking with its grains, colors and burls is American black walnut. The other wonder of the walnut slab is the cream outer sapwood ring. 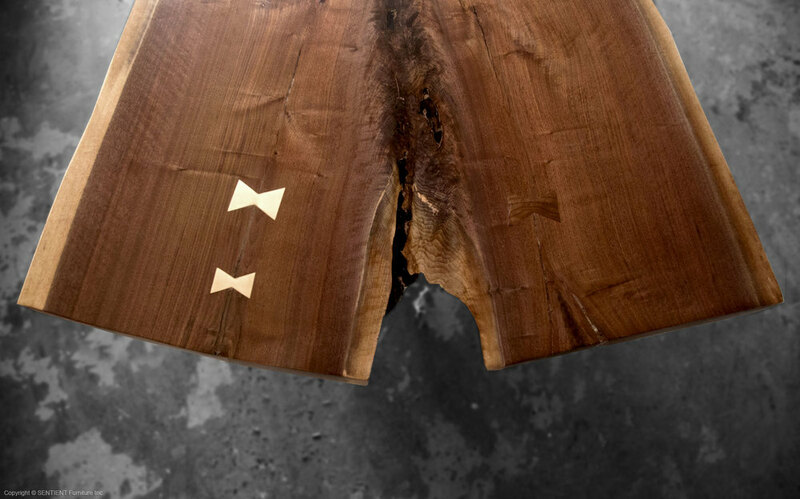 The outer cream sapwood on the edge of a walnut live edge table becomes an endless conversation feature. 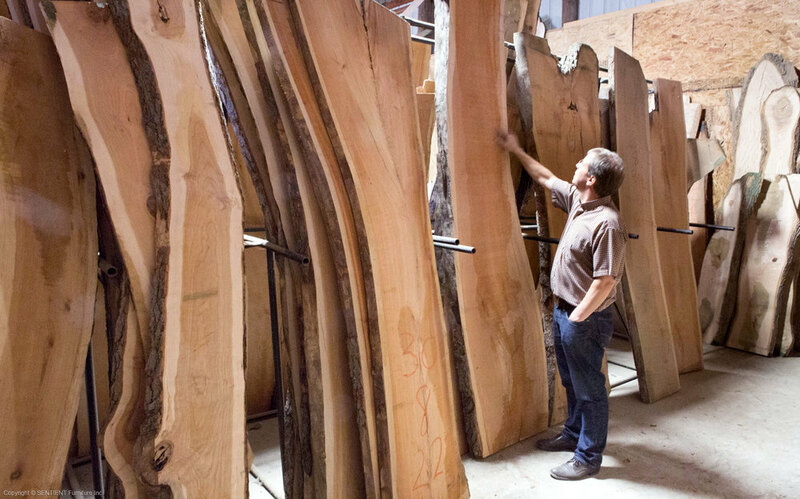 The SENTIENT live edge table collection displays all of these qualities in the best possible way. 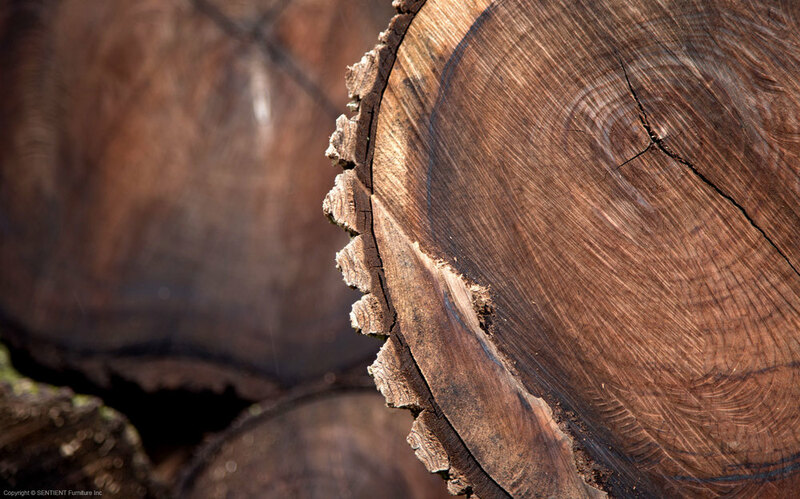 American black walnut wood species grows over a vast region in the United States. Eastern American black walnut grows on the eastern seaboard from Central Maine in the north to Georgia in the south then all the way west as far as Iowa in the north to Eastern Texas in the south. Black walnut is found in scattered growth as individual trees or in small groups. Black walnut is found in a variety of growing sites. It grows in well drained coves on hillsides. It grows with a round tree crown with heights ranging from 70 feet to 150 feet depending on growing conditions such as sunlight and ground water. The crown can spread up to 80 feet. If it grows in a more dense environment like all trees it will grow taller. Commonly black walnut can develop massive branches spaced along the length the trunk. Branching often provides the spectacular burls and grain effects found in black walnut when used for furniture production. Black walnut is an excellent furniture grade hardwood. It must be dried carefully to avoid checking (cracking). Black walnut works well with tools, receives nails and screws and can be glued. It has excellent finishing qualities in that it will receive most finishing products. When dried black walnut weighs approximately 3.5 pounds per board foot.